State routes are typically highways that were not submitted to, or not eligible for, a US Highway or Interstate designation. Some states define what can and cannot be a state highway. Some may only adopt paved roads of a certain width, other state may not regulate what they sign as a state route at all. 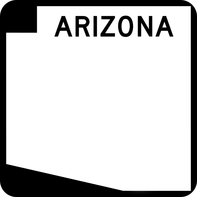 MUTCD recommends a simple black on white square, similar to US Highways shields, but with a circle instead of an actual shield shape. States are encouraged to come up with their own designs however, and most have. All 50 states have state routes, but smaller states tend to use the standard 'white spot' shield in place of a specialized one.